Plate 20 from the third set of Thomas and William Daniells' 'Oriental Scenery.' 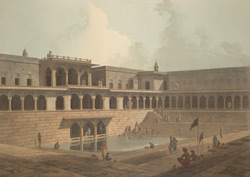 This step-well or baoli consists of a square tank surrounded by arcades on various levels and with flights of steps on three sides. It was built by Raja Chait Singh of Benares (1770-81) near his palace, at Ramnagar, on the river Ganges, just above Varanasi.